His version of the Dose is a stellar hybrid board that will crush it behind the boat as well as lapping the cable park. Shawn Watson has been riding professionally for what seems forever. Just like Tom Brady though, the dude shows no signs of slowing down with his riding. Whether taking a boat lap on one of Floridas many waterways or hitting features at a nearby cable park, he continues to kill it in every way. Watson and Liquid Force shaper Jimmy Redmon continue to work together to make an amazing board year after year. For 2017 the duo set out to develop a board that rides incredibly well behind a boat but is a comfortable option at the park as well. This years board features extended edge channels, molded side fins, and removable quad fins for maximum grip and hold edging into the wake. The X Pattern on the top deck in the middle of the board gives it the necessary strength and rigidity for hard-charging boat riding while the three Liquid Rail Flex Zones at both tips helps give it a playful feel riding cable. The coolest feature of this board might be the new FlexTrack. An industry first, it is a totally flexible track system for mounting bindings. Compatible with Liquid Forces 4D bindings, this is arguably the most responsive board to binding interface ever. Try it for yourself and get ready to be impressed. 22.0" - 26.0". 55.9 - 66.0 cm. 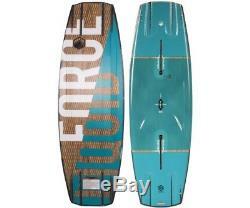 The item "Liquid Force Watson Dose 140 Wakeboard" is in sale since Thursday, January 18, 2018.